At my PIC page You can get one program only: The PIC programmer software POC for Windows. This software I had described in the german journal FUNKAMATEUR ("radio amateur") in may 2000. 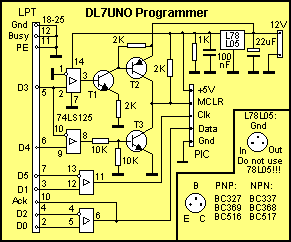 The task of POC is to burn PIC microprocessors under Windows 3.x, 9x (not NT) using an AN589 compatible low-cost-programmer on LPT (circuit below). POC should hopefully burn all PICs of the so called MidRange series with Flash/EEPROM memory. These are for example PIC16F84, PIC16C84 and the new PIC16F877. POC does not burn the old PICs with EPROM and also not the much older 12 bit PICs. But note that only the 3 above mentioned PIC types could be tested. POC is free for non-commercial use and is no cripple-ware (no restrictions). The online help is very detailed and both in english and german available. Important: POC doesn't run under NT because it uses direct hardware pot access. Screen Snapshot of POC (POC can be switched between english and german). POC hardware. It's simply an AN598 variation, the original AN589 harware design of Microchip can also be used. By the way: "Don't use 78L05" means only the original 78L05 is more bad (not protected against short circuit).